Every Friday night I have a small job to do. I used to be a relief driver for a local courier company until my back told me I’d better quit. I’m still on the payroll, however, doing a small but light delivery job every Friday night. Truth is, none of the regular drivers wants to do a Friday night job. This simple delivery involves taking some newspapers and several light boxes to nearby town, leaving at about 9:30pm. Not much good for seeing any birds. A few weeks ago I had just pulled out of our driveway when a Barn Owl swooped down from a nearby tree, snatched something from the road surface and then flew off with its supper, probably a mouse. If I had been going at speed it would have become another road kill. I was just only beginning to accelerate, so I didn’t hit it. 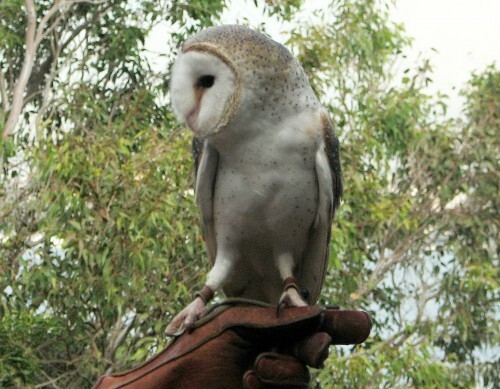 Barn Owls are common and widespread throughout South Australia but one usually only gets to see one in the car headlights as it crosses a road at night, or being mobbed by smaller birds while roosting in a tree. Sadly, I don’t yet have a photo of this species. UPDATE: I forgot that do have several photos – see one below. Post updated on July 12th 2015. Glad you managed not to hit him. Hi there Nicole – thanks for visiting. Bird photography takes a lot of patience, I’ve found.